Do you need to use two computers alternately but still want to work on one monitor and one keyboard? Here's how. 2) not to have to swap cables by hand. There is a few so-called KVM switches with HDMI and USB on the market, but they are a little bit overpriced. OK, they are overpriced as hell and we could not find a cheap KVM switch anywhere. 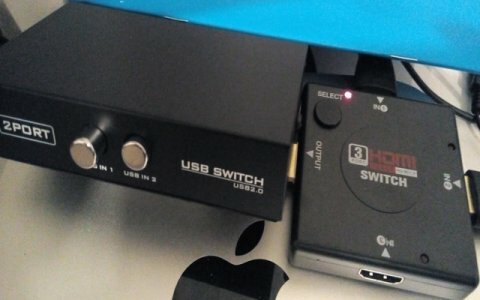 But an HDMI switch is a mass affair with the price - in Chinese e-shops - under $3 and a USB switch (designed primarily for sharing printers, but also working for a keyboard and a mouse) is only slightly more expensive - under five dollars. So for less than $8 we have a switch that makes it easy to see what exactly is our second computer doing - and connect it to our keyboard, mouse and printer when necessary. It's simply something like a very cheap KVM switch. (It works OK for us - and we can see no reason why it should not, but we give of course no guarantee and if you decide to try this as well it is on your own risk :). Update: This cheap KVM switch is working for around 2 years here now, and still no problem).